2. Change it to 'Flights. Note that the AirCanadaVacations sets it to search for 2 passengers by default, unlike most sites. I always get people telling me the 'price has doubled'. It hasn't. Note that it requires an overnight stay in Montreal on the way back. halifax, yhz, flight deals, central america, liberia, costa rica, lir and air canada vacations. 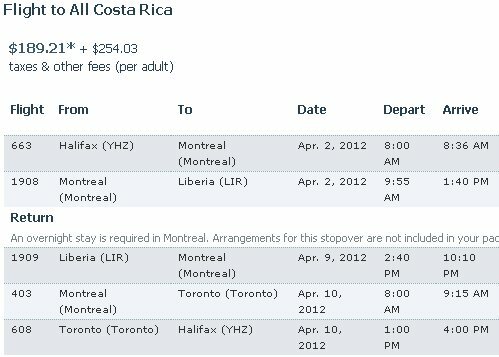 2 Responses to "Halifax to Costa Rica - $443 roundtrip after taxes"
Unfortunately I do believe it has sold out now. It might have been a one day sale to celebrate leap year (Feb 29) because the price from Montreal was $29 + taxes. The drastic drop in the Montreal fare is what caused the Halifax fare to drop as well.